« What’s Wrong With This Job Growth Picture? The tally is in and according to the NH Department of Revenue, last year’s $.10 cut in the rate of the state’s cigarette tax resulted in a loss of $12 million dollars for the state. Note that tobacco revenues were down much more than that for the year, but that is the amount attributable to the rate cut. It is about $500,000 less in revenue (out of over $200 million) than I forecast in a study that I conducted for a number of health related organizations, you can read it here. About a week after the rate cut took effect the industry raised prices by $.10 in New Hampshire. In case you are wondering, industry prices are not the same and do not move similarly in all states (look at the industry produced “Tax Burden on Tobacco” for historical state sales and price data to confirm this). 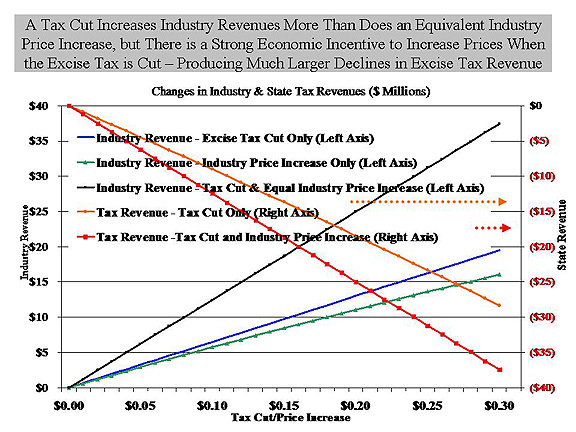 If you want a way too busy chart thati illustrates the strong incentives the industry has to raise prices when tax rates are cut, here it is ( from page 22 of my report). The $12 million reduction in revenue related to the rate cut is also $16 million less in revenue than the proponents of the tax cut argued in a “study” introduced during legislative debate ( that does not appear to be available any longer online). There are a lot of reasons why cigarette sales and revenues decline over time (demographic changes, gasoline prices, etc.) all of which I included in my modeling of revenues but none of which were included in the estimates produced by advocates. Advocates of the rate cut never mention these factors when sales drop, they only cite tax rate increases for declines (higher rates do decrease sales) but they are now offering them as the reason why tobacco revenues are are $16 million less than they forecast (because the orthodoxy says lower rates on their own can never be accompanied by lower revenues). Except that isn’t the reason. Factors outside of the rate decrease (demographics, gas prices etc.) account for the difference between the total decline in tobacco tax revenue over the year (just over $20 million) and the amount attributable to the rate decline ($12 million). So about $8 million in the total decline in revenue is a result of factors other than the rate cut. Sometimes cuts in tax rates can increase revenues, but the belief that they always do has become an ideological orthodoxy that can undermine cases where reduced rates can empirically be shown to increase revenues. I am all for ideological arguments in policy making when they are based on evidence and not orthodoxy, but we run a risk of making bigger errors in public policy when we can’t distinguish between the two. This entry was posted on October 11, 2012 at 12:30 pm and is filed under Uncategorized. You can subscribe via RSS 2.0 feed to this post's comments.